The latest In Service Apparatus and changes. Dennis E-106 2003 - American LaFrance Eagle 1500/500/40 Rescue Pumper. Otis Tec 417 2000 - Wells Cargo Tech Rescue Support Trailer. COMM L-307 2001 - Pierce Quantum 1500/500 105' Quint Aerial Ladder. Bourne Breaker IN PROGRESS - Bourne is having another brush breaker built. To be similar to Breaker 129 on a Military Chassis built by FireOne. It will replace the 2001 (1974) Military 2.5 ton Breaker 127. Expected delivery 2018. 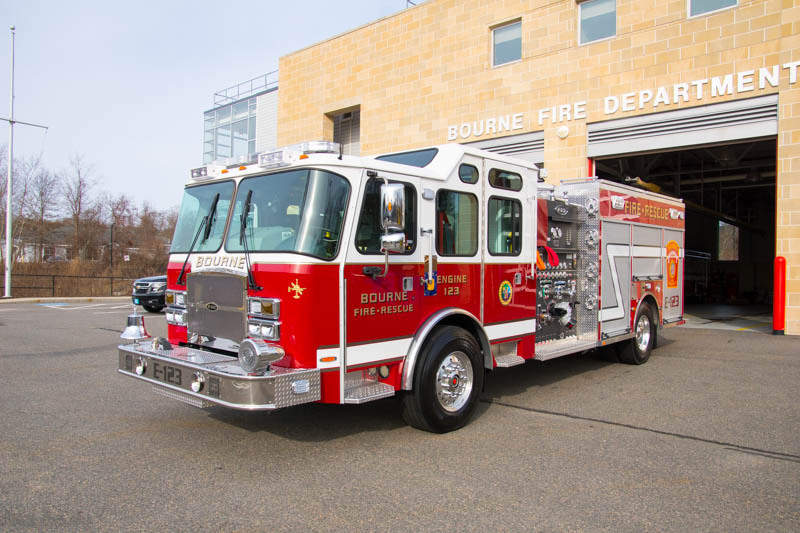 Bourne Eng 125 ORDERED - Bourne has ordered a new engine to replace the 1995 International / EOne Engine 125. Expected to be 2018 Emergency One Typhoon 1500/750 Pumper. Will probably result in renumbering or reassignment of present apparatus. Chatham Engs ORDERED - Chatham has ordered (2) Rosenbauer 1500/750 Pumpers expected to be delivered in Winter 2018. The new twins will replace the 1986 Pierce Engine 188 and 1989 Pierce Engine-Tanker 186. The apparatus purchase was approved in 2016. One unit via a grant and the other via town appropriation. COMM L-307 IN PROGRESS - COMM Approved a major refurb of their 2001 Pierce Quantum 1500/500/ 105' Aerial ladder at the 2017 district meeting. The Ladder is expected back in Winter 2018. 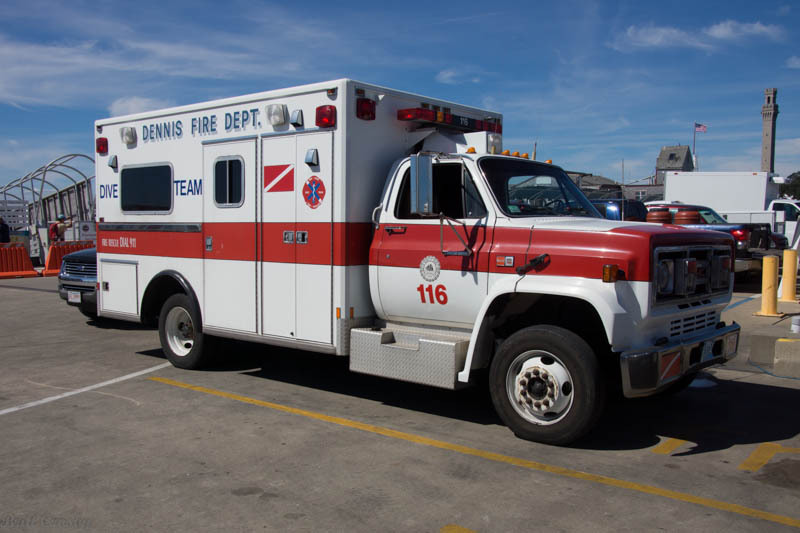 Dennis Amb ORDERED - Dennis has another Ford / Horton Type I Ambulance on order. Expected in 2018. 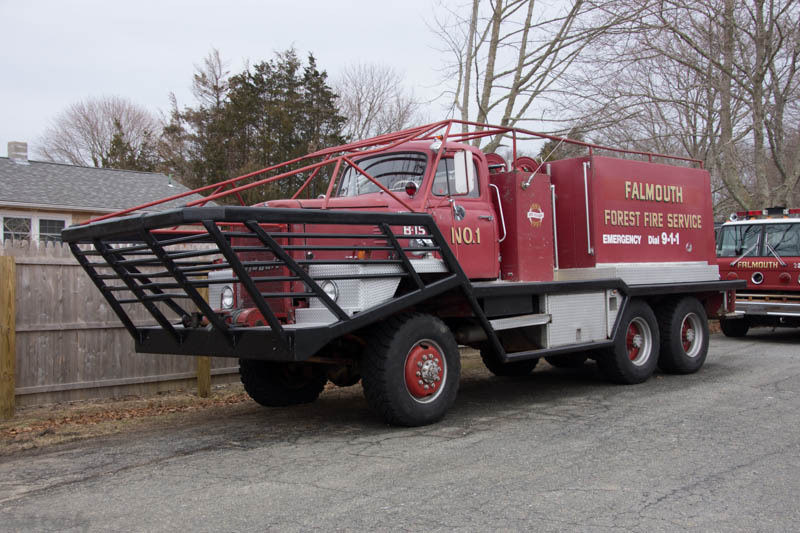 Falmouth Eng ORDERED - Falmouth has ordered a new Pierce Arrow 1500/750 Pumper. This order is the result of the failure of the 1996 E-One Foam Pumper E22 to remain in service. The new engine would most likely result in a shuffling of apparatus in the Fall 2018. 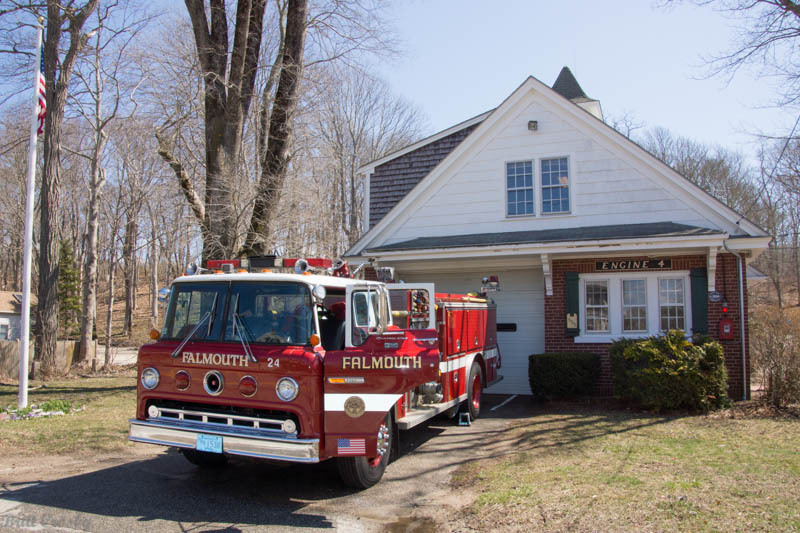 Currently the Falmouth reserve Engine 20 is actively serving at Station 2 with no spare. Falmouth Amb PLANNING - Falmouth is planning the replacement of an Ambulance in 2018. Harwich F-71 IN PROGRESS - Harwich took delivery of a surplus military LMTV 4x4 truck in 2017. The vehicle is being painted and prepared to serve as a high water / forestry truck. 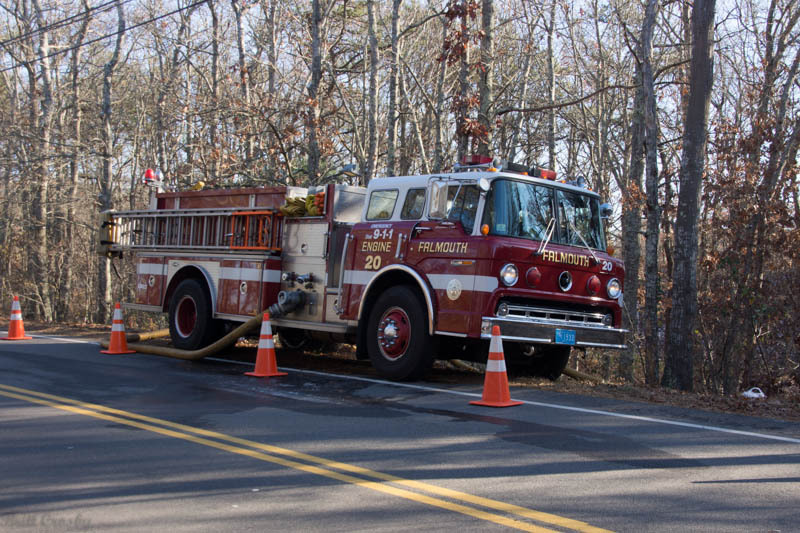 The 250/500 skid unit from the former Mashpee B-353 will be installed on the new forestry truck in 2018. Lakeville Engine ORDERED - Lakeville has ordered a 2017 Smeal 1500/1000 Pumper to replace their 1998 International / KME Engine 1. 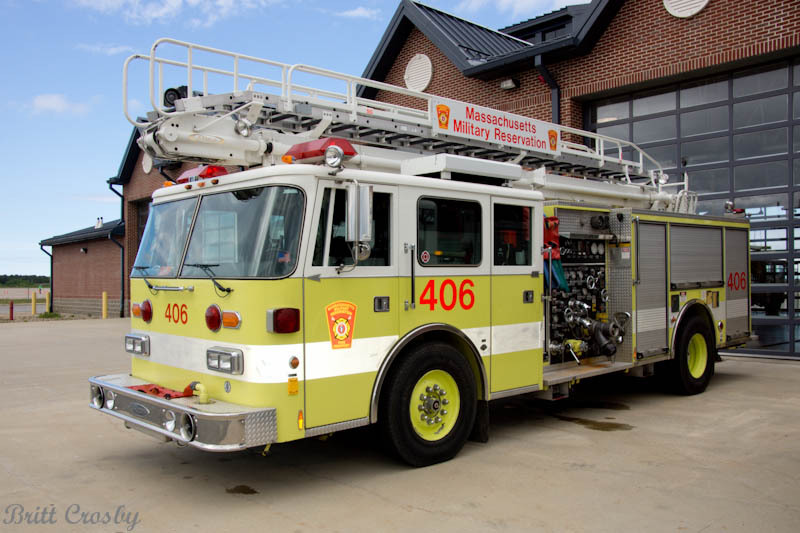 Mashpee ENG DELIVERED - Mashpee has taken delivery of a new E-One Typhoon eMax 1500/500 Pumper. The new engine is called Engine 352 and will be assigned to Station 2. The engine replaces the 1999 E-One Cyclone 1500/750 Engine 355 which has been reassigned as Engine 353 a spare engine. The Engine-Tanker 352 has been reassigned as ET-358. Onset E-1 PLANNED - Onset is planning to replace the 1988 Maxim Eng 1. Nantucket Amb DELIVERED - Nantucket has taken delivery of a new 2016 Ford F450 / Horton Type I Ambulance 4. A second ambulance is also believed to be on order. Nantucket Tankers DELIVERED - Nantucket took delivery of (2) former military LMTV 5 ton chassis in 2015. They were converted to 2000 gallon tankers and delivered in 2017. Nantucket Brush PLANNED - Nantucket hopes to build a brush breaker on a former military 5 ton chassis. Nantucket Forestry PLANNED - Nantucket has taken delivery of a Humve which is expected to be made into a forestry vehicle Utility 4. A similar vehicle has been added to the Nantucket land Bank fleet. 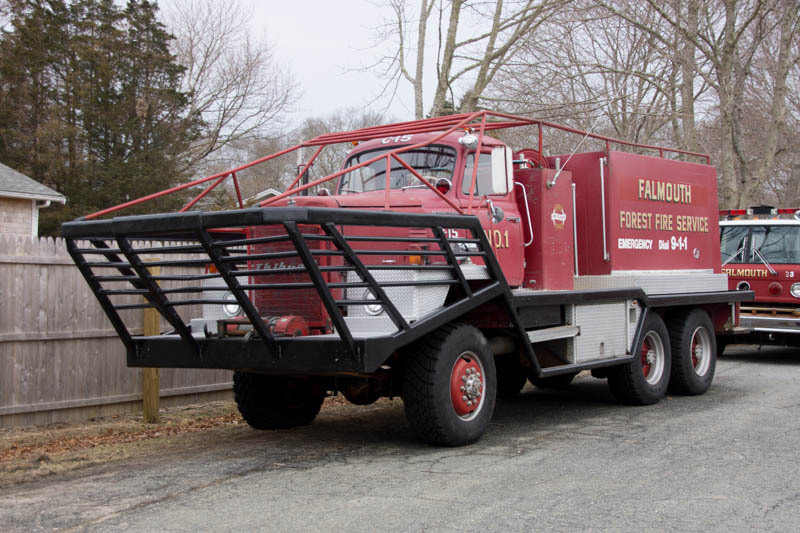 Nantucket Forestry DELIVERED - Nantucket took their old Engine 5, 1981 GMC Mini Pumper out of service. A 2000's Ford F350 with a 150 gallon skid tank has been assigned to Tuckernuck Island to replace it. Nan Airport ARFF DELIVERED - Nantucket Airport has taken delivery of a 2015 Oshkosh Striker Crash Truck. Onset Tanker ORDERED - Onset received a grant to purchase a new tanker to replace the old Tanker 147. The new tanker will be an International AWD / KME with 1250 gpm/1800 gallons. Expected in Spring 2018. Onset Breaker IN PROGRESS - Onset is building a new brush breaker on a 2004 BMY Harsco former military chassis. It will have a 350 pump and 750 tank. Expected to be ready for spring 2018. Onset Eng 1 PLANNED - Onset is planning to replace the 1988 Maxim Engine 1. Plymouth Eng 6 DELIVERED - Plymouth took delivery of a 2017 E-One Typhoon 1500/1000 Pumper for Engine 6. The former E6 1994 International / Pierce Contender has been reassigned to E9 spare. Sandwich T-465 ORDERED - Sandwich is having a former military Freightliner chassis converted to replace the 1973 GMC Foam Tanker. Fire One is doing the conversion. Expected Spring 2018. Tisbury Eng PLANNED - Tisbury is said to be planning a new Pumper. 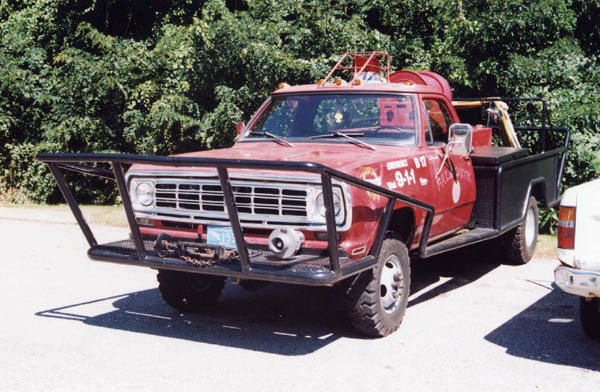 Wellfleet AMB ORDERED - Wellfleet has a new ambulance on order. Expected in early 2018. 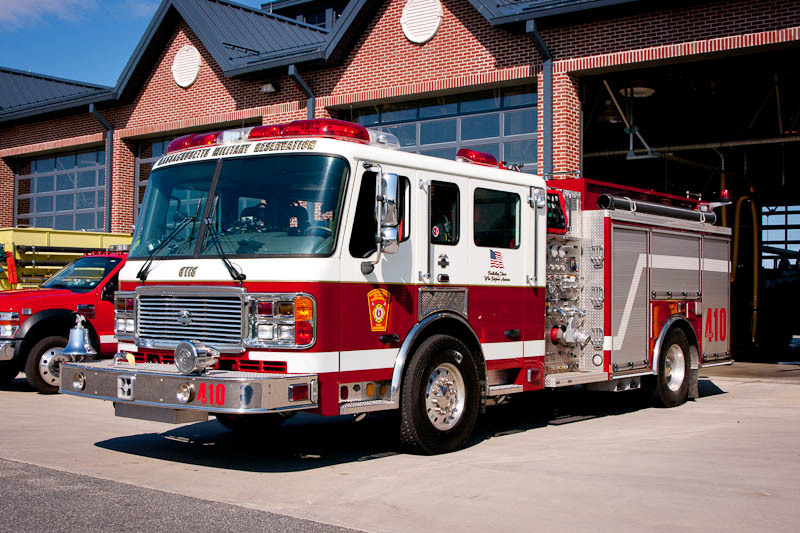 West Barn Eng 294 ORDERED - West Barnstable approved a new engine to replace the 2002 Pierce CAFS pumper Engine 294. A new Rosenbauer pumper is expected in Winter 2018. 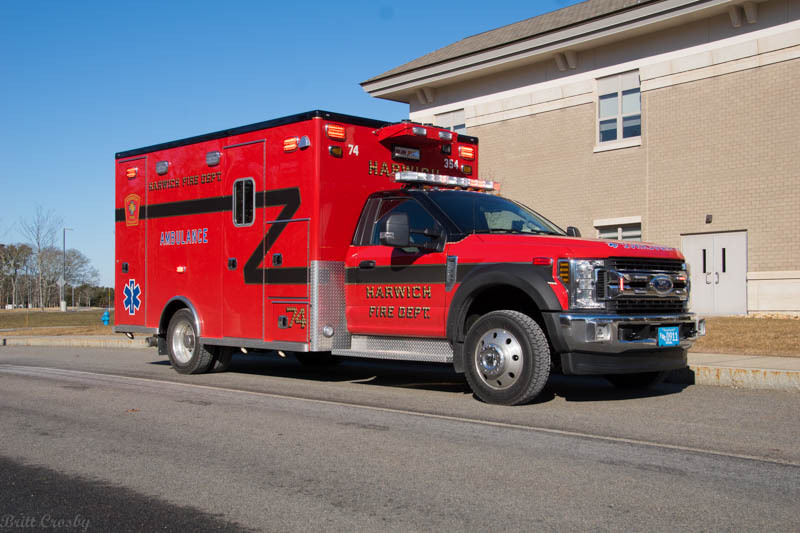 ORDERED - West Barnstable has a Ford F550 / Life Line Type I Ambulance on order for Ambulance 293. Yarmouth Eng 43 DELIVERED - Yarmouth put a new 2017 Pierce Dash CF 1500/500 PUC Pumper in service as Engine 43 at Station 1. The former E43, 2011 Pierce Impel PUC has been reassigned to Eng 45 to become first due at Station 3. The former E45, 2005 Pierce Enforcer has been reassigned as Eng 47 to serve at Sta.1. 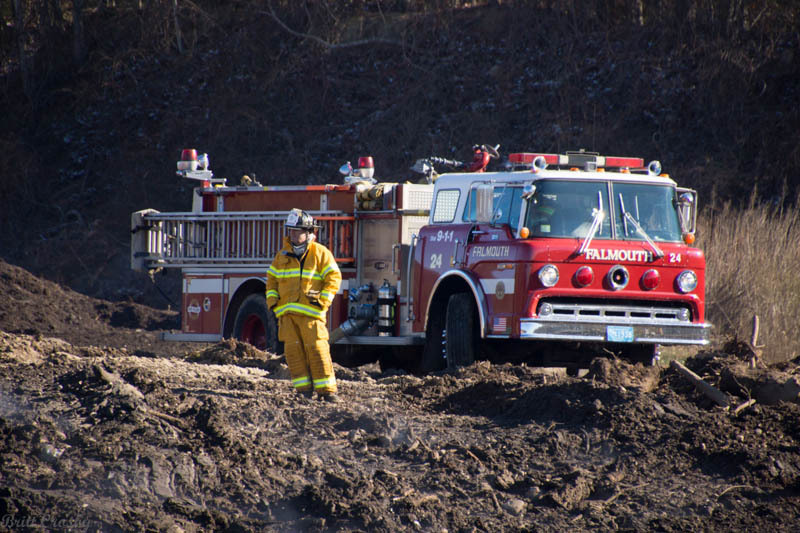 The 1985 Pierce Arrow, most recently E47 has been retired. Engine 42 and 48 will serve at Station 2, while E45 and E44 will be at Station 3.
bought by Lakeville in 2009. West Falmouth Station #4 and Engine 24. Engine 24 taken out of service and Station #4 has no fire truck. for other apparatus. It has been taken out of service. Breaker 17, 1977 Dodge Power Wagon taken out of service. Breaker 15, a 1971 International was taken out of service in 2014.